Western blot analysis of FZD6 Antibody (Center) in A549 cell line lysates (35ug/lane). 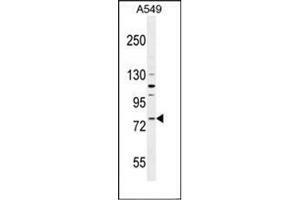 This demonstrates the FZD6 antibody detected the FZD6 protein (arrow). Specificity This antibody recognizes Human FZD6 (Center).